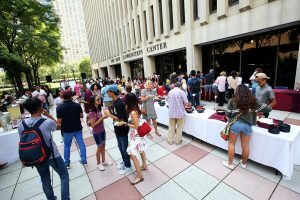 Fordham’s Rose Hill and Lincoln Center campuses were humming with energy Sunday, as more than 2,000 students and their families converged from all across the city, the country, and the globe for Opening Day. 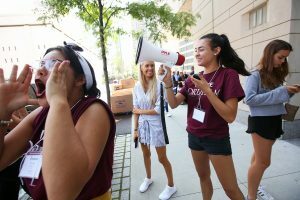 At the Rose Hill campus, many first-year students who arrived in SUVs stuffed to the gills were greeted in person by Fordham President Joseph M. McShane, S.J., who paired warm words with cold bottles of water. In an address at Lincoln Center in the afternoon, he told the Class of 2022 and their parents that the University has been “waiting for [them] for 177 years,” and that he’s been praying for them through the summer, as they are now family. And he noted that within their own families, things will begin to shift. “As of today, the family dynamic changes. To your mind, last night your child was an adolescent. Today they have become some new person, an adult. And the family dynamic changes to recognize that. Conversations at the dinner table will change as well,” he said. Olivia Jones, a Ridgefield, Connecticut, native whose parents Janet and Dana both graduated from Fordham in 1987, was settling into a room in Alumni Court South. She plans to pursue political science and the pre-med track at Fordham College at Rose Hill. Her mother noted that Jones was the youngest of three, and that her two other children had attended other colleges. 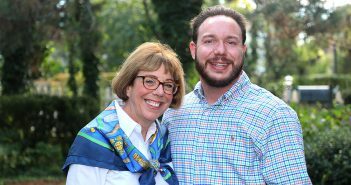 She and her husband met at Rose Hill, so she was excited one of their children would be a Ram as well. Asked how it felt to have an “empty nest” at home though, she gave two thumbs up and burst into laughter. Farrell Pelcher, also an incoming first-year student at Fordham College at Rose Hill, moved to the Bronx from Averill Park, New York, four days earlier to participate in Urban Plunge, a pre-orientation volunteer program for first-year undergraduate students. For Pelcher, who plans to major in communications, that meant working at a food bank and a local park. “It was a really cool experience, because it wasn’t just doing service projects, it was learning about the history of the Bronx and the context of everything we were seeing,” she said. At Rose Hill’s McGinley Center, commuter students were given their own red-carpet treatment, with cheers erupting when students checked in. Nadeem Majumder, a Fordham College at Rose Hill student from the Bronx neighborhood of Tremont, spoke excitedly of pursuing a career in computer science. His family moved to the United States when he was 6, and although he lived in California for most of that time, he remembered passing by Rose Hill on visits to his grandfather, who has lived in the Bronx since 1989. “I took a look one day, and that’s what made me want to apply in the first place. It was so beautiful,” he said. 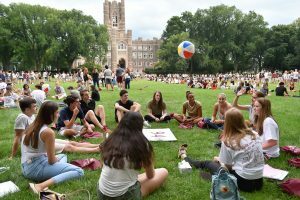 Rose Hill students gathered on Edwards Parade for orientation. Kelley Abunaw, a second-year transfer student from Douala, Cameroon, who was getting settled at Loyola Hall, said an extensive alumni network and the hard-to-beat location drew her to the Gabelli School of Business, where she plans to focus on finance and computer science. She and her mother took Metro-North from their hotel in Manhattan, and were pleasantly surprised at how smooth the move was. “It has a campus feeling, but New York City is right here. 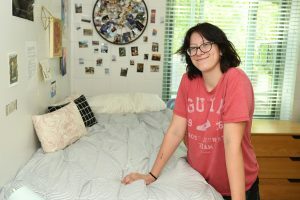 I love that I can go to the city but at the end of the day I can come back to a campus,” she said. Coming from a town where there was little to do, she was eager to get take in all of New York City. Fordham College at Lincoln Center first-year student Kayla Thomas and her parents Felton and Linda drove seven hours from Cleveland Saturday and spent a night in New Jersey before continuing on to the Lincoln Center campus, where Thomas will pursue a Fordham/Ailey School BFA in Dance. Lincoln Center students gathered on the plaza after moving in. “I love Ailey because I see people that look like me on stage, and not only because of the diversity in people and backgrounds, but also in dance styles,” she said. Her father said that despite New York’s reputation as a safe city, he and his wife were nervous because they were dropping Thomas off so far from home. Maryanne and Tom Tice were excited to drop off their son Aidan. An experienced traveler who had already spent two summers in China learning Mandarin, he will be majoring in global economics at Fordham College at Lincoln Center. “We honestly don’t expect him to move back home to California, but we’re OK with that, we just want him to be the best version of himself and to embrace the opportunities he’s been given,” said Maryanne. 731 residents and commuter families joined the class of 2022 at the Lincoln Center campus. Fellow Californian Chase Gallion set her sights on moving to New York during her first years in high school, where she had a pretty rough couple of years. “My ultimate goal was to do everything and anything to get to New York and I did it. 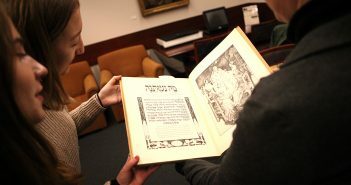 It was a process, but the I knew the way to get here was to work hard academically,” she said. She plans to study writing in film and television, an industry her mother, Vicky, works in. Her father, Michael, said that Gallion’s drive made it easier to see her attend school so far from home. Students and parents at Rose Hill were also given a chance to savor one last moment together as the day came to a close, with a mass in front of the University Church, and some time set aside for goodbyes. Afterward, students held a candle-lighting ceremony on Edwards Parade, marking the close of one chapter and the beginning of a brand new one. John W. Buckley, vice president for admission and student financial services, said he couldn’t be more pleased with the 2,286 members of the incoming class. 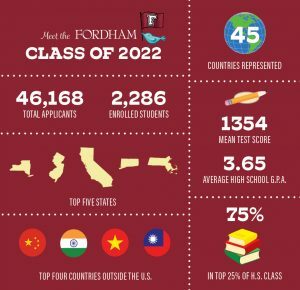 “We are delighted to welcome this extraordinarily talented and diverse Class of 2022 to the Fordham family,” he said. 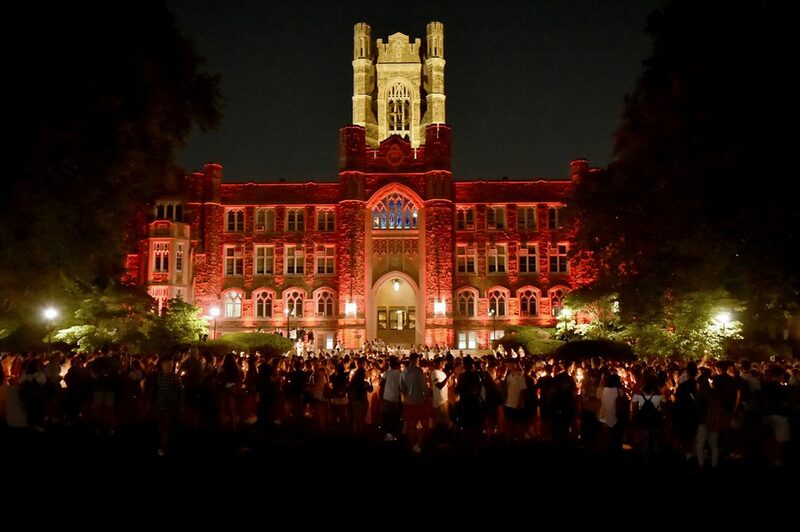 Keating Hall was the site of a candle light ceremony on Sunday evening.